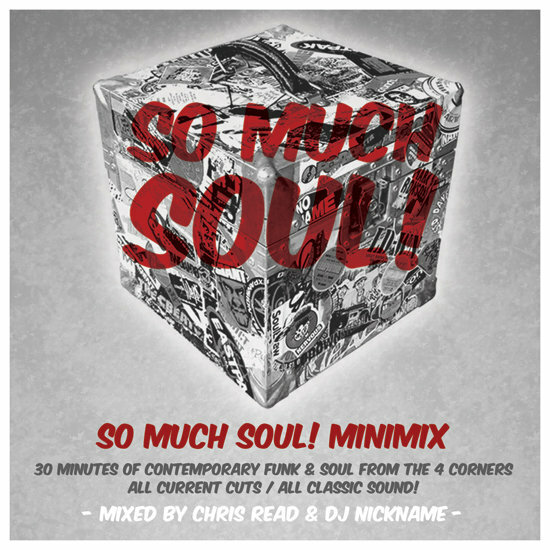 30 minutes of modern funk and soul – All current cuts / All classic sound! Put together by DJ Nickname and I as a promotional item for our new central London night, SO MUCH SOUL!, which takes place on the second Saturday of every month at The Social on Little Portland Street, W1. The mix includes tracks by the likes of Quantic Soul Orchestra, Nicole Willis and Randa Khamis who will be performing live at our next night. We hope you enjoy and, if you do, please spread the good word. We hope to see you on the dancefloor some time soon! Over and out… the SO MUCH SOUL! crew.